NAS units capable of only accepting 2.5" drives have been a rarity, but the launch of WD Red drives in that form factor has given a boost to vendors looking to cater to that space. 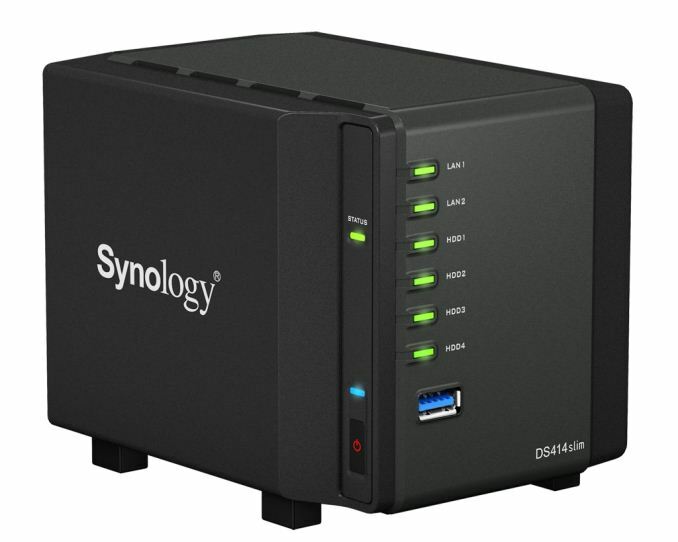 Synology launched a 2.5"-drive only 4-bay NAS back in 2011 (DS411slim). This year, we have a refresh, the DS414slim. The Synology OS (Disk Station Manager - DSM) has evolved into a very capable, user-friendly and feature-rich server OS in its own right. Its high-performance iSCSI features make it very attractive for virtual machines. The 414slim comes equipped with a very capable SoC (the Marvell ARMADA 370 running at 1.2 GHz, which we already saw in the LenovoEMC ix4-300d) and sports four hot-swappable drive bays, two USB 3.0 ports and two GbE links. Inside the system, we have 512 MB of DRAM. Since 2.5" drives don't consume a lot of power, the unit is able to do with a 30W external power adapter. The small size of the system as well as the massive RAID-able storage capacity (4 x 1.5TB supported currently) and rich networking capabilities make it an ideal mini server for those experimenting with virtualization and have a space-constrained setup. When was 6TB massive? Certainly not at the time this article was written. so don't go ranting in a news post about 2.5" NAS. there are people who prefer them. 6TB **is** massive. in the **context** of a 2.5" consumer NAS. The question though should be why does it not support the 2GB Toshiba drives. 6GB is certainly better than 4.5GB (assuming RAID5 or the like). As an aside.... why has the 2.5 GB HDD market stagnated with regards to density? We have 6GB desktop drives... I would assume that 3GB 2.5" drives are possible. "i have a 48x4TB server in a closet and it's basically just our household NAS."